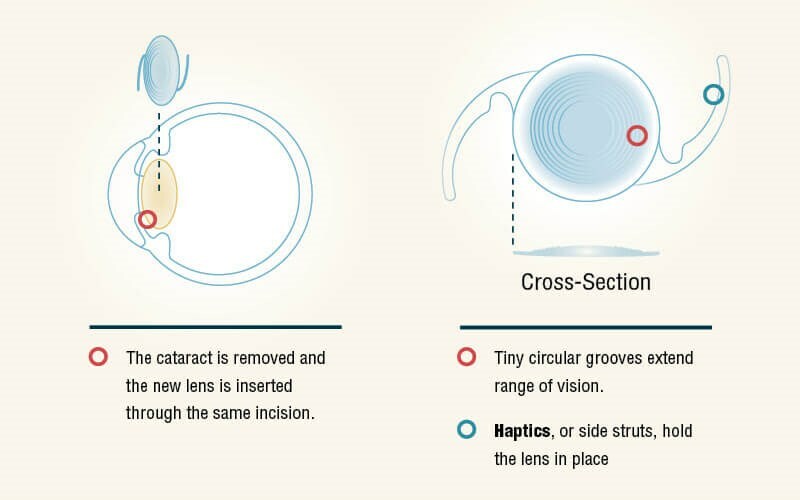 At Vance Thompson Vision, we work to provide our patients the best technology for effective vision correction, and we are excited to be able to provide our patients with the option to choose the Tecnis Symfony lenses for their cataract surgery. The Tecnis Symfony intraocular lenses (IOL), approved by the United States FDA in July 2016, are the first of their kind for treating cataracts. The Tecnis Symfony lenses are able to create continuously clear vision with an extended range of vision. The Symfony technology allows patients to have clear vision at near, intermediate, and far distances with a reduced dependence on glasses. The Symfony lenses are able to correct for some of the visual problems of people with presbyopia by making it easier for people to focus at close objects. Tecnis has both a toric and non-toric option, so people with astigmatism can experience astigmatism correction with the toric Symfony lens. Because of the technology that creates an extended range of vision with the Symfony lenses, they have a low incidence of halos and glares, which compares with the low incidence for the monofocal IOL. Cataract surgery with the Symfony lens works similarly to surgery with other IOLs. The surgeon removes the old, cloudy lens from the eye and replaces it with the new lens. While most IOLs correct only for distance vision, the Symfony lens works to create clear vision at all distances.